There are extraordinary prizes available for those who get a hole in one, including a car, a golf cart and an executive chair; O’Yes balls will receive 40” TVs plus assorted electronics, accessories and certificates. The gorgeous Jack Nicklaus-designed Vidanta Golf Nuevo Vallarta will host the third stop of the Mundo Golf Tour 2016 on September 3rd; the tournament is returning to the Riviera Nayarit for the second consecutive year. There are many high end prizes for those who achieve a hole in one: Hole 8 receives an Audi A3 Sedan (whoever wins must pay a 15% deductible; not valid for professionals or caddies), Hole 12 takes home a golf cart and Hole 17 a Stella Pro executive chair. The O’Yes prizes are for Holes 4, 8, 12 and 17; the first to make them will receive a 40” LED TV and the four subsequent players will receive other electronics, accessories and gift certificates. There’s only one category and participants can be men or women with handicaps from 0 to 28 (HCP). They will play 18 holes A-Go-Go with four-person teams with HCP’s from 0 to 28 per player; the handicaps from each player are then added together and the resulting number is added to 10% of the HCP. 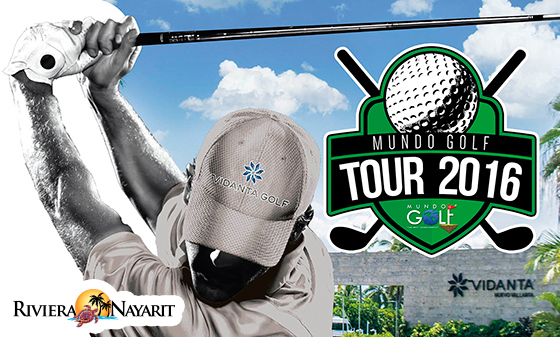 There are medals for 1st, 2nd and 3rd places; the winner and second place teams will be able to continue on to play the finals during the May 2017 Mundo Golf Tour at Vidanta Nuevo Vallarta. The winners will receive registration in the tournament as well as three days and two nights in a Master Suite at the Grand Mayan for four people, not including food and beverage. The tournament committee reserves the right to make any modifications or changes necessary to improve the development of the tournament. In case of a tie it will be broken using scores beginning in the 18th original hole on the course and counting backwards. This is for teams in 1st, 2nd and 3rd places. The recovery fee is MX$1,800 (plus VAT if a receipt is required). For registration information, questions and details please contact Hiram Castillo via phone at 3312175891 or 3331463424 or by email at mundo.golf.hiram@gmail.com.